We spotted these remarks when the vice president, who is deeply religious, tweeted them out after giving a speech at a conservative Christian college in Michigan. There was a furious backlash by religious researcher Joshua Grubbs that in reality many studies showed the opposite of what Pence claimed — that religion is declining in the United States. But the vice president’s remarks were so specific that they must have been based on something. So we decided to research the matter. The Federalist article referred to a 2017 study, published in Sociological Science, by Landon Schnabel at Indiana University at Bloomington and Sean Bock of Harvard University. The Federalist also mentioned research on the growth of religion since the American Revolution, principally the work of Roger Finke of Pennsylvania State University and Rodney Stark of Baylor University. This is the figure that is referenced. You can see that while greater percentage of Americans have no ties to religion, there is a persistent percentage of Americans with a strong affiliation. Other charts show a similar trend. Whereas the percentage who never attend religious services is climbing and the percentage who sometimes attend is falling, the percentage who attend multiple times a week has remained steady. But Schnabel says that Pence missed the key point about his study. In other words, the study suggests that the conservative Christianity celebrated by Pence appears to be turning off other Americans with more moderate views on religion. Schnabel added that one aspect of Pence’s remarks was “wrong by more than omission: Weekly attendance is declining. It’s only more-than-weekly attendance that persists.” Once-a-week attendance has dropped from 28.5 percent in 1972 to 17.5 percent in 2014, according to the Association of Religion Data Archives. He likened it to a “container getting smaller, but more concentrated,” such as espresso vs. coffee. “To be clear, Americans as a whole are not becoming more involved in religion, and average religion is declining,” Schnabel said. As for Pence’s claim that “four times as many Americans go to church on a regular basis than at the time of our nation’s founding,” that was derived from research by Finke and Starke for their book, “The Churching of America.” We have reproduced a chart from the 2005 version of the book below. Their numbers for 1776, based on the fact the Colonial churches didn’t have the capacity to hold a high percent of the population on any given Sunday, are lower than some other researchers. But there is little dispute among researchers that there was rapid growth in the proportion of people who were listed as members in churches in the 19th century and early 20th century. Pence’s office initially said it wanted to provide a comment but then decided to take a pass. Pence has latched onto one specific study to make the claim that the percentage of truly religious in the United States have remained consistent in recent decades and that “faith is gaining new life across America.” But that study actually undermines his point, as it demonstrated that except for a core group, religion is fading away for other Americans. Other studies back up those trends. 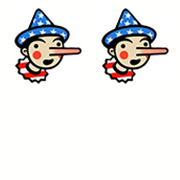 Pence earns Two Pinocchios for his cherry-picking. He’s also simply wrong to claim that weekly attendance has been consistent; it’s been dropping for years. “The percentage of Americans who live out their religion on a weekly basis — praying, going to church, reading and believing in the Bible — has remained remarkably consistent over the decades, even as the population of the United States has grown by leaps and bounds."